Connect with a Demo Account - eCommerce site - those who don't have Google Analytics can get all GA functionality in this demo account and gets hands on training and experience. I have worked with Google Analytics since its first version and taught the classes since then. I teach in a way that even a beginner (with no background) can understand and lead the content to more advanced level content. 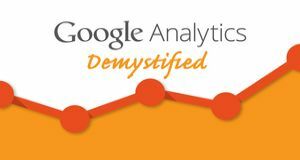 Note: This is a beginner’s course and meant for those who want to learn Google Analytics. This course applies to everybody from individual running their blogs to people working in the corporations. If you are looking to start a career in Digital Marketing or Analytics, this course is a must for you. You will learn the skills you need to analyze your website performance and visitors. Speaker, Best Selling Instructor, Adviser and Executive Anil is a seasoned Digital Marketing and Analytics professional with 15 years of experience. He has worked with companies ranging from Fortune 50 to startups and has helped them improve marketing results. His customers include Microsoft, SmartMoney, ESPN, T-Mobile, Hoovers, RealNetworks, Starbucks, and TheStreet. He holds a B. Tech in Electronics and Communication Engineering from India and an MBA from University of Washington, Seattle. Anil has taught and trained several Marketing and Analytics folks in past nine years of teaching at UBC, University of Washington and Bellevue College, and speaking engagements at various conferences as well as his blog. He teaches Digital Marketing, Digital Analytics, Google Analytics, Tableau and Social Media courses. He also served on the Board of Digital Analytics Association (DAA) and was instrumental in starting the DAA Symposiums. Anil is the founder of Global Analytics Academy and Optizent, a Digital Marketing and Analytics consulting company.